These are my girls. Every day they bawk-bawk-squawk… and that’s before they’ve even laid an egg. These three are actually our second round of hens. Let me introduce you to them. (left to right) Dusty, our Delaware; Ginger, the New Hampshire Red; and Dotty, our Barred Rock. Before I tell you about these funny-feathered hens, let me tell you about the chickens we no longer have. Buffy was our Buff Orpington; Bunny was our Easter Egger (Americauna), and poor Pearl was our little bantam Cochin. Buffy and Bunny were my first chickens; don’t even ask me how I convinced Travis to let me get chickens in the first place. I’m not sure I even remember anymore. I think I was going through a sustainable, happy farm animal phase. This may also have been when we thought we were going to buy a cow at the fair auction (for meat, not as a pet). Anyway, these two gave us beautiful, delicious eggs and a year later I declared that two chickens were barely keeping up with our egg consumption and we needed more. That’s when we got Dusty, Ginger, and Pearl. Travis was enamored with Pearl and her fuzzy little feet. Because Pearl was a bantam breed (small), she came straight run from the feed store (not sexed) and every day we hoped she would stay a she… and not end up crowing as a rooster. Sadly, a poorly engaged gate latch and quick dogs with a strong prey drive killed Pearl before we ever really knew what she would grow up to be. This same poorly engaged gate latch was the cause of Bunny’s demise and the nearly-fatal mauling of Buffy. Buffy did survive, with some antiseptic spray and time in a dog cage and some TLC. By this time, we had a re-coop-erating (heh) hen and two growing pullets (Dusty and Ginger). But then Buffy kept going broody (refusing to leave the nest box) and I couldn’t break her of the habit. Because broody hens don’t lay eggs and the other two weren’t laying yet, I was actually having to buy eggs. From the store! After some internet research, I decided that we were just going to have to give Buffy what she wanted – a baby chick. It was getting to the end of of chick season, but Hawthorne Country Store in Escondido still had day-old chicks. We picked up the cute Barred Rock with the dot on her head and headed home. I actually recorded the little chick peeping and played it on a loop on my iPod. We played it for Buffy as it was getting dark (I read it was supposed to be like a peeping chick getting ready to hatch) and then Travis slipped the little fuzzball under her. She got a little fluffy, then settled down. We figured she would either freak out in the morning or be a happy mama hen. 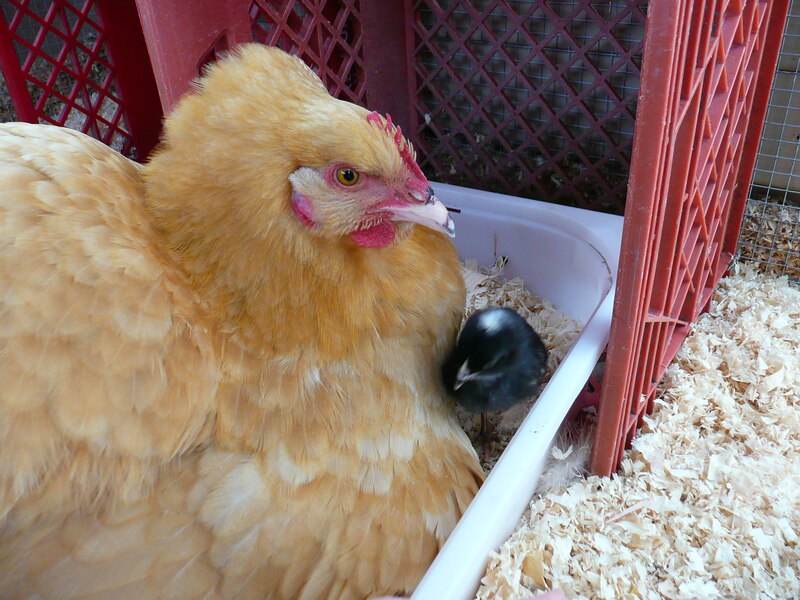 Buffy was a really good mama hen. She was very protective of little Dotty and would show her how to dig for worms and what was good to eat. Not too long after Dotty grew up and Buffy finally started laying again, we had an immense heat wave and Buffy didn’t survive. Thus, we were left with three chickens – the ones you see at the top. These girls lay an egg every day. Dotty lays the largest ones, but Ginger lays the prettiest brown ones. Because they’re so fresh, the white don’t ooze all over the pan and the yolks sit up nice and high. Our chickens don’t free-range unless we lock the dogs up (dogs and chickens don’t mix! ), which isn’t very often. They do have a large enclosure (and have been moved into a newer, bigger one) and I dump weeds and grass clippings in every week. They also get anything from the garden that is bug-bitten and fruit that got too ripe. Kitchen scraps and dinner leftovers also go into the “chicken bucket”. All these greens and treats (in addition to their layer crumbles) give their egg yolks a bright orange hue. While they get a bit noisy in the mornings, they usually just walk around and cluck quietly. They know the sound of the screen door opening, as this usually means we’re coming out and headed towards them with some sort of treat. They huddle at the gate and follow you when you walk in; if your hands are empty, sometimes Dusty will jump up just to check. Because we raised Dusty and Ginger as chicks, they’re very friendly and will let us pet them. Because Dotty was raised by a protective mama hen, she’s a little more skittish. I truly love our chickens and I have to say my sweet husband has been more than patient with my little farm hobby. He’s also put a lot of work into making their new enclosure, building strong fences to keep the dogs out, and hauling 50-lb bags of feed to the back of the yard. Chicken posts can be found in its own category.